The degree of vertex is the total number of vertices in the graph minus 1 or we can say that the number of vertices adjacent to a vertex V is the degree of vertex. A directed graph or digraph is a pair (V, E), where V is the vertex set and E is the set of vertex pairs as in “usual” graphs. 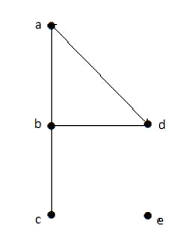 The graph in which each vertex has its indegree and outdegree is known as directed graph. Indegree of vertex V is the number of edges which are coming towards the vertex V.
Outdegree of vertex V is the number of edges which are going away from the vertex V.
The graph in which there is no directed edges is known as undirected graph. Symmetric directed graphs: The graph in which all the edges are bidirected is called as symmetric directed graph. Simple directed graph: The directed graph that is without loops is called as simple directed graph. Loop directed graph: The directed graph that has loops is called as loop directed graph or loop digraph. Complete directed graph: When each pair of vertices of the simple directed graph is joined by a symmetric pair of directed arrows, this graph is called as complete directed graph. Oriented graphs: The directed graph that has no bidirected edges is called as oriented graph. Weighted directed graph: The directed graph in which weight is assigned to the directed arrows is called as weighted graph. Flow networks: These are the weighted graphs in which the two nodes are differentiated as source and sink. Rooted directed graph: These are the directed graphs in which vertex is distinguished as root. 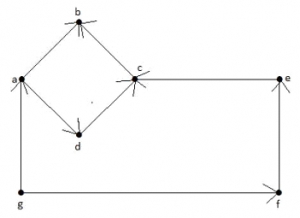 Signal flow graphs: The directed graph in which system variable is represented by nodes and connection between pairs and nodes is represented by branches are called as signal flow graphs.